Matthew Anderson grew up playing chess, tennis and was also an Eagle Scout. He played a month in junior high before walking away. “I wasn’t really able to embrace it, so I stopped playing,” Anderson said. This past fall, during his junior year of high school, Anderson decided to give the game another shot. There were two things about football he was drawn to – the first was recognition. As soon as he stepped on the field, Anderson was assigned to offensive line. Not exactly what he had in mind. Anderson discovered the second part of football he loved – hitting people. He’s the No. 1 ranked tennis player at Leesville High School in Leesville, Louisiana, but his efforts on the court are going toward making him quicker on the field. Nimble, physical, and athletic. That’s what Northwestern State offensive line coach J Pond saw in Anderson that other Power Five programs didn’t. 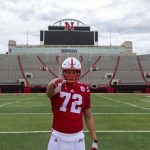 So Pond, a friend of Nebraska running backs coach Ryan Held, called the Huskers and several other major programs to make them aware of the tight end-turned offensive tackle. Nebraska was the first major program to get in touch. “I didn’t have any other Power Five offers,” Anderson said. “I probably could have waited a little bit longer, and I probably could have gotten those SEC offers, but I decided to fire my shot. Once you feel at home, you commit. I think I’d be doing myself an injustice if I were to go SEC or if I were to go to one of those other schools. Anderson gave praise to Held, offensive line coach Greg Austin and of course, head coach Scott Frost in his recruiting process. But, the only who really sold him on Lincoln was head strength and conditioning coach Zach Duval. Anderson is certainly new to football, but his 6-foot-6, 250-pound frame puts him at an advantage. His size and athleticism make it seem like he’s been playing for much longer than he has, but Anderson knows there’s much work left to be done if he wants to hit people and get praised for it at the next level. Anderson plans on redshirting once he’s on campus next year, but his pursuit to become a player who both hits people and gets praise for it won’t slow. Fortunately for him, Nebraska is a place where many offensive linemen have come through and received recognition for knocking people over.